There are a few central principles that good graphic design tends to be based upon. In the future, you’ll hear me banging on a lot, for instance, about ‘hierarchy’ and ‘rhythm’ (both stories for another day). Instead, today, let’s talk a bit about another of those principles: contrast. Strong and confident use of contrast (and I don’t mean the button on your TV/monitor) can be the difference between a piece of design that looks average and amateur and one that looks stylish and professional. Contrast is about differences. Most commonly, in design, people think of it in terms of colour. Two colours that are very similar (deep orange and primary red, for instance) have much less contrast than two colours that are very different (dark blue and yellow). But your contrast doesn’t have to be all about colour. It could be about size. A strongly contrasting design might incorporate very large elements and very small elements. Or it could be about shape: smooth curves set against jagged edges. Most people are afraid of contrast. If you try and put two very different elements together, there’s a chance you’ll fail, and fail very conspicuously. On the other hand, if you put two very similar elements together, there’s not that risk. Big contrast = big risk. This is because people notice contrast. The flip side? People tend to ignore things that exhibit low contrast. If you want your work to look designed, start using contrast. Sure, it may not always work out. But how much better to learn through failure than to stagnate through timidity? This doesn’t mean everything has to be dramatic or unsubtle. Not at all. And you need to be strategic in your use of contrast: don’t make every part of your design contrasty, or you’ll have a crazed maelstrom of competing elements. 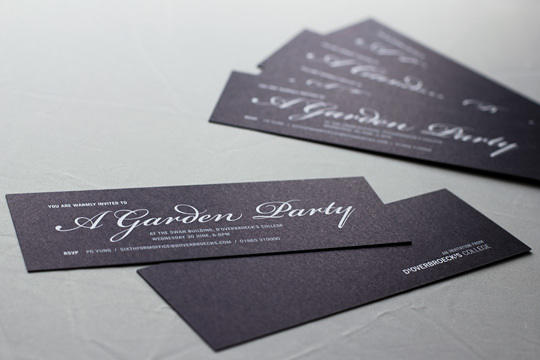 … It’s an invitation I recently designed for the d’Overbroeck’s College Summer Garden Party. Not a high-profile piece of work, and also a job that I had very little time to carry out. But I turned to my guiding principle of contrast to give me a quick solution. So where’s the contrast? I guess there’s contrast inherent in white text on a dark background. But the contrast I’d like to focus on is that of typeface. I’ve paired a beautiful script font – all fluency and curvaceous lines – with stolid gothic capitals. There is huge contrast, here: large vs small, flowing vs blocky, classic vs modern, lowercase vs capitals. This is confident contrast. It reflects the ethos of the organisation I’m designing for (modern, bold) and also the nature of the event (a ‘traditional’ garden party). So it’s not just gratuitous contrast-for-contrast’s-sake. But I know that people will see that invitation and will respond to it as if it’s something proper, something high quality. Because the invitation looks designed. Nobody would expect that kind of contrast from an invitation that someone’s PA had knocked out on the office printer and cut on the guillotine.